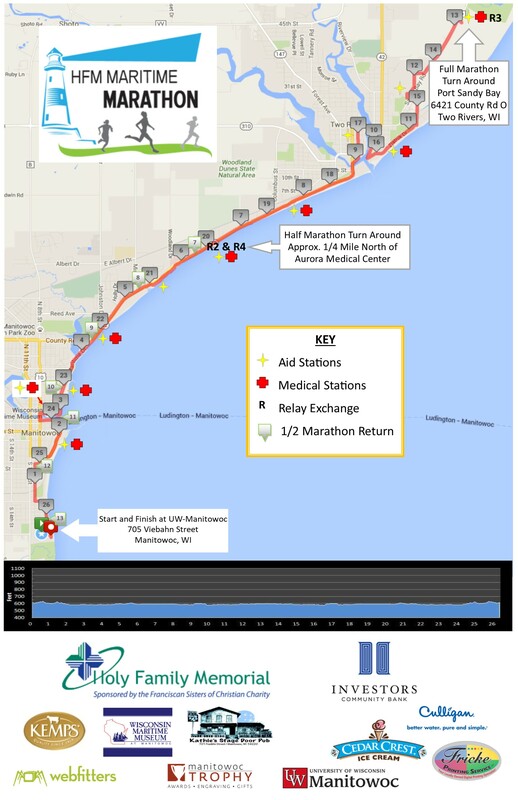 The half marathon is 13.1 mile course that closely follows Lake Michigan starting at UW-Manitowoc along the Mariners Trail. The runners will return to the finish along the same route. Unfortunately mail-in registration is not available. For more information, please contact us. After your picturesque finish on the shores of Lake Michigan, items will be available to start your recovery off right. Food and beverages will include brats, burgers, ice cream, water, gatorade, and of course, beer. Make sure to pose for a post-race picture with your one-of-a-kind finisher’s medal. Most importantly, congratulate and share stories with your fellow runners! In the full and half marathon, awards will not only be given to the overall top female and male, but also the top 3 female and male participants in these age groups: 18-29, 30-39, 40-49, 50-59, 60-69, and 70 plus. Each runner will receive a race packet prior to the race. That packet will include a technical short-sleeved t-shirt, a pair of FREE wigwam running socks, your race bib and disposable timing chip, and Friday and Saturday night coupons for drink and food specials at Kathie’s Stage Door Pub and The Courthouse Pub.